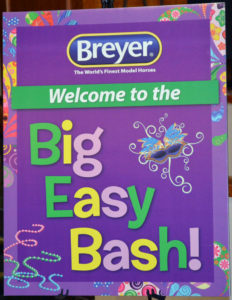 Not too long ago, Breyer announced a Kid’s Only Tour of the Breyer facility in New Jersey. I was disappointed to find that my son would be too young to attend and scrapped the idea of attending. 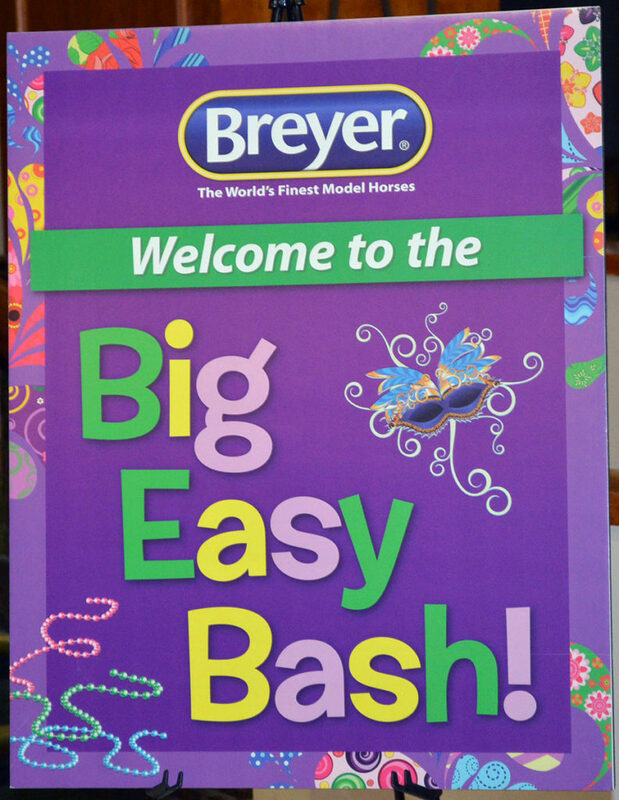 Then, last year, Breyer announced that they would be having a factory tour event in 2014. Excited, I haunted their website for any tidbit of information but none seemed to surface. By pure luck, I stumbled upon the ticket sales for the Big Easy Bash posted just a few days before Thanksgiving. The tickets needed to be purchased in pairs and financially, the trip would not be an easy one. My first thought was to sleep on it and reconsider the next day. Ultimately I ended up purchasing the tickets that same night, I didn’t want to risk the chance of them selling out while I thought it over. This turned out to be a good idea as the tickets were gone the next day. Now, since the tickets had to be purchased in pairs with the attendees named at the time of purchase, I put down my name and my husband’s. My intent was to change my husband’s name to my good friend’s name who was at the time, unavailable to contact. Breyer had allowed name changes at past events and while they specified no name changes this time, I thought little of it. I was shocked to later learn that Breyer was sticking to their no name change policy. This frustrated me but it still sounded like it would be a great event. A factory tour and a live model horse show, can it get much better? At this point, I put the Big Easy Bash to the back of my mind and literally didn’t think about it for month. That is until I heard that the show class list had come out and I hadn’t heard so much as a peep from Breyer. Hmm… I contacted the lovely staff over at Breyer and confirmed that I was indeed missing the emails that were being sent out. I thought that it might be a problem with my email address and I had it changed to an alternate one. Mean while, I caught wind that the show was only 5 classes and that there would be no halter classes. Since halter is the only division that I show in, this disappointed me greatly. I was ready to cancel my Big Easy Bash tickets. But guess what Breyer was also enforcing? A no refunds policy! I admit, at this point I was more than a little peeved. A halter division had been indicated at the time of ticket purchase. I stewed over the class list change for a bit. I should also note that the original posted dates for Big Easy Bash was 1 week prior to the finalized date. My husband put in his once a year vacation to match the original posted date and did not have time off for the modified dates. At this point I was at a loss, I couldn’t get my money back, I couldn’t change the name on the ticket and my husband didn’t even have the time off work. I did the worst thing that I could have at this point and mentally blocked the event all together. Come January, my husband asks me about the Big Easy Bash. Do I have plane tickets and are we going? Well erm…I don’t know? I watched plane ticket prices and bit the bullet and purchased when I saw them drop below $500 a ticket. The end of February rolls around and we make our way to the airport at 7am for a 9am flight out of our tiny 1 terminal airport. 9am flight? The United man behind the couner chuckles at us. “Oh no, that flight is delayed for at least 2 hours!” This will make us miss our connecting flight from San Francisco to New Jersey. I grit my teeth, determined to not make a scene. “But” the United man says, “I have already rebooked you on a 3:30pm connecting flight to New Jersey.” At this point I could have hugged the man behind the counter. What a guy! We made San Francisco with time to spare. We had a nice lunch and hung around waiting for our connection. I am notoriously bad about checking my phone and turned airplane mode off to check for any missed calls. The phone blinked indicating that I had missed a call while in the air. I checked my voicemail. It was my mom who wanted to know if we were going to NJ this weekend as she had heard about “the snow.” Uh oh, what snow? I didn’t have much time to think about this before boarding the next plane. We landed in Newark a little before midnight. This eliminated our original plan of taking public transportation to the hotel. The hotel didn’t offer a shuttle and our only option at this hour was a taxi. I choked at the cost of $65 for a 12 mile taxi ride but we had arrived in one piece at the hotel and all I could think about was sleep. We erm, overslept on Friday. I finally dragged myself out of bed at 2:30PM. In my defense, we were 3 hours jet lagged! The Breyer event was set to start at 5:45pm. This didn’t leave us a whole lot of time. The last time that we had eaten was at 6pm the night before and this was mostly a little snack on the plane. We wandered the bottom floor of the hotel. The only restaurant was closed, the coffee place was closed and so was the gift shop. We looked at a map and determined the closest place to eat would be a half mile walk and it was literally freezing outside. I decided to just buy some snacks from the snack machine. You know that sinking feeling you get when a vending machine eats your money and gives you nothing in return? Well, we got a lot of that feeling… Grumpily, we returned to the room and miraculously survived the next couple of hours without killing each other. But there were some close moments! At 6:00pm, we checked in at the Breyer table and loaded on to the bus for a short trip to Medieval Times for dinner and a jousting show. I very much enjoyed the show. The horses were beautiful and the food was good. The lady sitting next to me was a total crack up. I mentioned my concern about flying out on Monday due to possible snow. Her reply was along the lines of “Yep, you’re screwed!” But with a now full belly and the stress gone of making it to NJ, even I had to laugh. 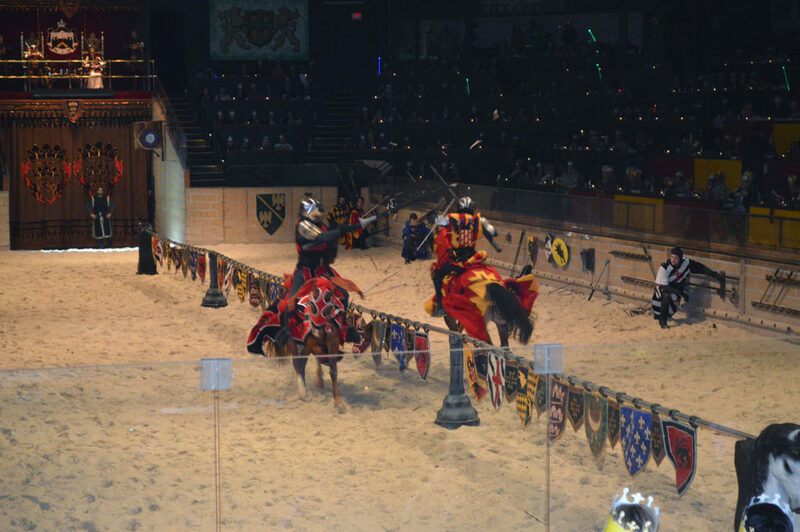 Following the show, the Breyer group was treated to a special meet the show’s horse trainer and introduced to one of his special horses, Excalibur. Excalibur is a breathtaking 4 year old Andalusian Stallion. He is a dark steel dapple grey in the early stages of turning white. He has a distinctive black mane and an ivory white tail. He is extravagant with classical Spanish movement and he stood calmly while the trainer talked and we admired his baroque beauty. It’s no secret that I have a special passion for Spanish horses. In fact, I have an Andalusian mare of my own. But even I was impressed by the quality and extraordinary temperament of Excalibur. In closing, one of the last things that the trainer said was “Thank you for making Excalibur a Breyer.” I made a mental note to look for the model of Excalibur. I hadn’t heard about one but then I am not a big OF collector so this didn’t surprise me. However, if Breyer made a nice Andalusian model I would be tempted to purchase one. On the bus, we learned that this tidbit of information had been a slip up on the trainer’s part. Jaime Potalesky told us that the center piece model at the dinner on Saturday would be Excalibur and that he would be “different.” She wouldn’t reveal the mold but we soon learned that it would be on the Breyer Legionario mold.